The day I’ve been waiting for since November 8, 1987 has finally arrived. How Mick, Tommy, Vince and Nikki looked the last time I saw them in concert. 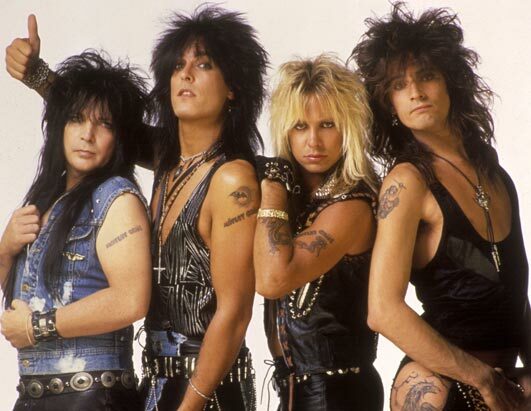 That date was the first and only time that I saw Mötley Crüe, until today when Vince, Mick, Tommy and Nikki invade Alpine Valley in East Troy, Wisconsin, on their tour with KISS. Even though that concert was nearly 25 years ago, I can still remember it well, but that could be because I wasn’t old enough to drink yet. Regardless, I remember loading up in my friend Sam’s family van with my friend Daniel to make the 4-hour trip down to Jackson, Mississippi for the concert. Sam’s dad sat reading a book during the concert. It was so thick that I think it may have been War and Peace. To help block out the noise he put cigarette butts in his ears. We didn’t protect our ears and screamed to the top of our lungs to every song the Crüe belted out. We played along with Tommy Lee as Vince belted out Wild Side and stood in awe during his drum solo, the one where his kit lifted from the stage and started turning. Tommy Lee was spinning like a drum-playing rotisserie. I’ve seen the progression his drum solos over the years and can’t wait to be amazed by what he has in store for me tonight. Over the past few years I’ve read Mötley Crüe’s book, The Dirt, Tommy Lee’s book, Tommyland, and Vince Neil’s book, Tattoos and Tequilla. 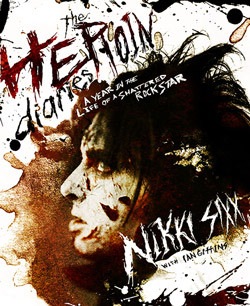 But hands down my favorite book on the band is Nikki Sixx’s The Heroin Diaries: A Year in the Life of a Shattered Rock Star. It’s an AMAZING collection of Sixx’s journal entries during the height of the Crüe’s success that gives an unbelievable insight into the highs and lows of his life… and death. The soundtrack to the book, by Sixx:A.M is so good that I listened to it straight through everyday for almost two months. Sixx’s second book, This is Gonna Hurt, is very good too but it didn’t affect me the way that The Heroin Diaries did. Not surprisingly Tammy isn’t as excited about tonight as I am and wasn’t to thrilled with me blasting Crüe songs in the kitchen this morning as I prepared everything for our tailgating before the show. I’m hoping to write a comprehensive post about the concert, like I did when we saw Kid Rock last summer, but I can’t make any promises. Because tonight we’re gonna party like it’s 1999 1987… and I can’t wait!! Gallery | This entry was posted in Daily Life and tagged Concert, daily life, humor, Mötley Crüe, Music, Nikki Sixx, Tammy, Tommy Lee. Bookmark the permalink. What a great show back in ’87. Did you mention that GnR was the opening act? Wow.